President Donald Trump has continued to escalate tensions with California by calling on the state to return billions in federal funds for a high-speed rail. His administration plans on cancelling $929m (£711m) in grants for what Mr Trump has called a "failed" project. These federal funds account for a quarter of the California rail project. Democratic Governor Gavin Newsom called it "political retribution" for the California-led lawsuit against Mr Trump's national emergency declaration. 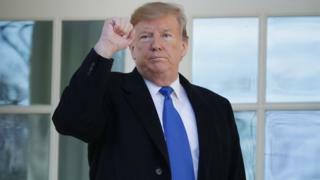 The Trump administration announced on Tuesday that it is looking into cancelling the $929m grant as well as recovering a $2.5bn grant already being spent by the state. In a tweet on Wednesday, Mr Trump again lambasted the state over the project, saying: "Send the Federal Government back the Billions of Dollars WASTED!" Just a day prior to the announcement, a coalition of 16 US states led by California said they were suing the president to block his "misuse of presidential power" over building a US-Mexico border wall. All but one of the states involved are governed by Democrats. The battle between Donald Trump and California Governor Gavin Newsom, carried out in speeches, tweets and legal filings, now includes a hefty price tag. The US government has spent billions helping construct a high-speed rail line in California. Now, after cost overruns and cutbacks in the scope of the ambitious project, the president wants the federal money back. That may be difficult to pull off - and will surely face an extended court battle - but that's not the point. Mr Newsom is fighting the president over emergency funding for the border wall, so the Trump administration is going after the state's rail funding. This latest drama puts the conflict between the conservative White House and the most prosperous and populous state in the nation, one fully controlled by Democrats, in stark relief. California's leaders have offered their state as a "counter-proposal" to Trump's America - a demonstration that progressive policies and regulations can go hand-in-hand with economic growth and well-being. It's the antithesis of the Trumpist view that restrained regulation and limited government involvement open the path to success. It's a battle over ideology and principles - a civil war conducted in courts and the court of public opinion. Following the news of the lawsuit, Mr Trump had slammed Democrats, "the radical left", the 9th Circuit courts, and taunted California over the rail project. Gov Newson said in a statement on Tuesday that "it's no coincidence that the administration's threat comes 24 hours after California led 16 states in challenging the president's farcical 'national emergency'". "This is clear political retribution by President Trump, and we won't sit idly by. This is California's money, and we are going to fight for it." Will Trump win his legal fight over the wall? What's the current rail situation? California's initial plans, approved in 2008, involved a high-speed rail linking San Francisco and Los Angeles with an estimated cost of $77bn. Since then, overrunning costs and delays have plagued the project and in his state address last week, Gov Newsom said they would be scaling the project down and focusing on connecting regions in the Central Valley for now. At the time, Mr Trump attacked the project, saying the state owed the government $3.5bn for the "green disaster". On Tuesday, his administration took steps towards collecting those funds. Gov Newsom hit back by saying Mr Trump's claims were "fake news". Can Trump take back the funds? California and the federal government signed an agreement in 2010 over this funding. Per the agreement, the federal government is allowed to take the money back if the state does not make "adequate progress" or "fails to complete the project or one of its tasks" or if the state cannot meet the funding-match requisite, CNBC reported. California has not yet met the $2.5bn funding match, and so it has not been able to use the $929m. Federal Railroad Administration chief Ronald Batory said in a letter on Tuesday to the state's rail authority that California has "materially failed to comply with the terms of the agreement". The letter cited the governor's altered plans for the system along with California's inability to match the federal funds as grounds for terminating the award. California's rail authority has not yet responded to the letter. Art Bauer, a California Senate Transportation Committee staffer, told the Los Angeles Times he could not recall any precedent for such an action, but that "the governor unwittingly gave the federal government a reason to back away from the project".